Trauma can result not only from catastrophic events such as abuse, violence, or loss of loved ones, but from natural disasters and everyday incidents such as auto accidents, medical procedures, divorce, or even falling off a bicycle. At the core of this book is the understanding of how trauma is imprinted on the body, brain, and spirit, resulting in anxiety, nightmares, depression, physical illnesses, addictions, hyperactivity, and aggression. 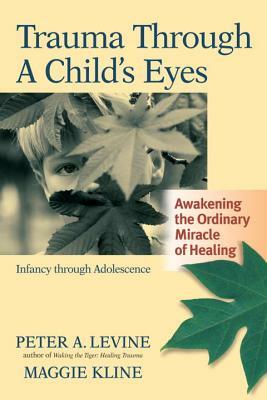 Rich with case studies and hands-on activities, Trauma Through A Child’s Eyes gives insight into children’s innate ability to rebound with the appropriate support, and provides their caregivers with tools to overcome and prevent trauma. Dr. Peter A. Levine, author of the best-selling Waking the Tiger and of Healing Trauma, has a background in medical biophysics, stress, and psychology. He developed Somatic Experiencing®, and serves as a consultant to the Meadows, a leading residential addiction recovery center. He lives on the banks of the St. Vrain River in the Rocky Mountains. Maggie Kline, MS, MFT, has more than thirty years of experience as a teacher, family and child therapist, school psychologist, and parent. She is a senior faculty member for Dr. Levine’s Professional Training Program and resides by the sea in southern California with her therapy dog, Beijo.